Including signature pieces for Santana and King Crimson’s Jakko Jakszyk, as well as a new SE Paul’s Guitar. 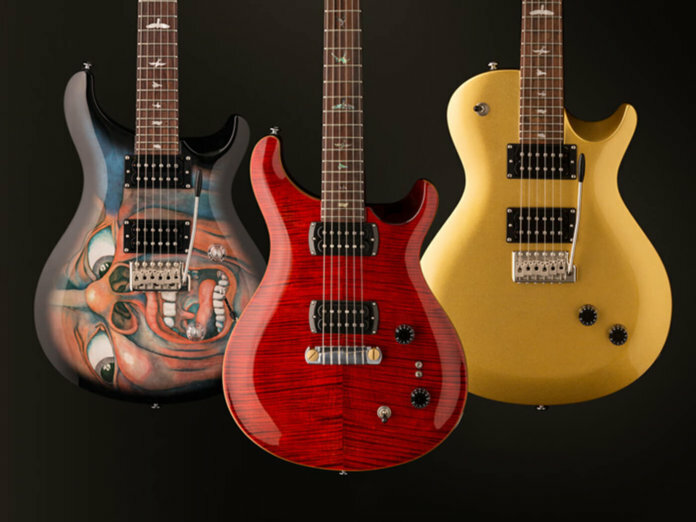 Having recently announced the classy McCarty 594 Hollowbody II, PRS is keeping up the pace with three new SE signature models: the SE Santana Singlecut Trem, the SE Schizoid and the SE Paul’s Guitar. This guitar is an SE version of Carlos Santana’s gold leaf single-cut model from the Private Stock collection. Its tone is derived from two TCI “S” humbuckers. These are based on the TCI pups featured in the 2018 Paul’s Guitar, but come without coil taps – a specification requested by Santana. In terms of build, the guitar features a mahogany body, a mahogany neck, and a 24.5-inch scale length. Its hardware appointments include a tremolo bridge that has a range of two full octaves. “The SE Santana Singlecut Trem has a range and universal tone that delivers with power and clarity, allowing you to find your own voice in your heart’s music,” Santana said in a statement. Available from Spring 2019. Retails at £799. To celebrate the 50th anniversary of legendary prog-rock group King Crimson, PRS has released a signature guitar for lead singer and guitarist, Jakko Jakszyk. The model will be available as a limited run, with only 1,000 pieces up for grabs. The first thing you’ll notice about this guitar is its eye-catching finish. Its body is adorned with classic artwork from King Crimson’s In the Court of the Crimson King album. The axe also features a mahogany body, a mahogany neck, and a 25-inch scale length. In terms of electronics, the SE Schizoid is loaded with a pair of 85/15 “S” humbuckers. These pups are wired to one master volume knob and one push/pull tone knob. Wrapping up the instrument’s look are PRS-designed tuners and a PRS-patented moulded tremolo. “When PRS asked if they could make me something special it had to be a guitar with that iconic artwork. The ‘Schizoid Man’ face that started this whole journey off. Full circle as it were,” said Jakszyk. Available from March. Retails at £729. According to the brand, the SE Paul’s Guitar “delivers a lot of ‘PRS’”. The axe features an electronics system previously unique to the Private Stock and Core lines. It’s loaded with TCI “S” treble and bass humbuckers that are governed by two mini-toggle switches, a master volume knob, and a tone knob. With these controls, you can configure either or both pickups to a true single-coil mode. By engaging the latter, you can achieve the clarity of vintage single-coils in both single-coil and humbucking positions. Wrapping up the instrument’s look is a PRS Stoptail bridge with brass inserts, a carved figured maple top, and three arresting finishes: Amber, Aqua and Fire Red. “The Paul’s Guitar, like the Modern Eagle before it, has always been about Paul’s latest discoveries in guitar making. To bring this guitar into the SE Series, we knew the tone, functionality, and playability had to be right and had to be consistent,” said Jack Higginbotham, COO of PRS Guitars. Available from February. Retails at £799.